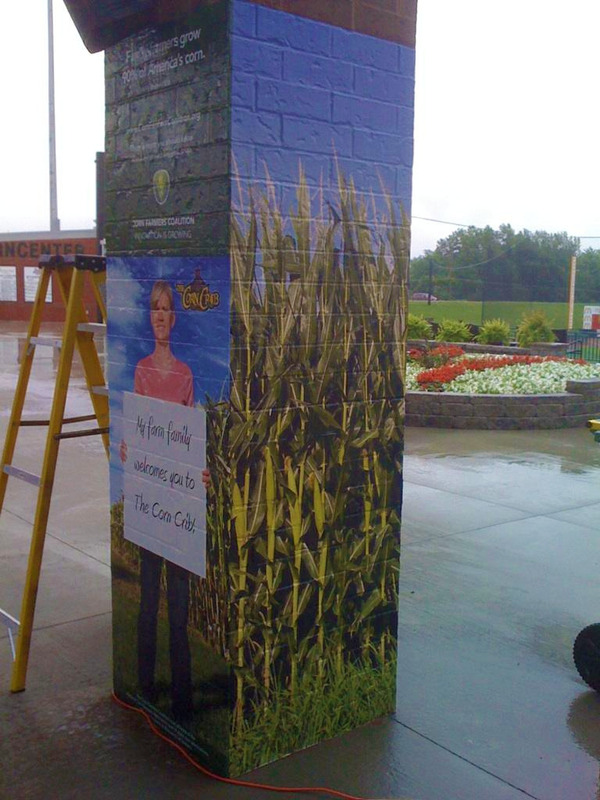 We're finding all kinds of ways to share information about corn and the family farmers that grow it at The Corn Crib, professional baseball's newest ballpark. The Corn Crib is home to the Normal CornBelters. If you visit you'll see messages like this one, reminding non-farmers that their friends and neighbors are the family farmers producing Illinois' highest valued crop. If you sit through a game, you'll hear conversations about corn and farmers happening between people that otherwise never would have talked about corn. Spontaneous shouts of "Let's Go Corn!" echo through the stands, and Corny, the CornBelters mascot, is high-fived wherever he goes. It's opportunities like this that can make a huge difference as more and more challenges to agriculture are being promulgated by detractors. Labels: CornBelters, Friday Farm Photo, Who are Illinois Corn Farmers? I heard it again just yesterday ... the general manager of a local hotel told me that he prefers smaller 600-700 acre farms over larger farms of several thousand acres. He couldn't tell me why, just that he liked the idea of a small farm over a large one. We chatted about it and I tried hard to listen to his concerns - something that farmers don't do enough of, and I admit, was difficult for me. The problem is that I didn't walk away from the conversation understanding exactly why he preferred smaller farms. Either I did a horrible job at listening or he really wasn't sure himself. Because of that recent conversation, this video really hit home for me this morning. Enjoy ... and share! Labels: Who are Illinois Corn Farmers? About a month ago, I visited the corporate headquarters for McDonald’s USA with the Illinois Beef Association. It was a really interesting visit, where I learned things like ’27 million people eat at McDonald’s Global every single day’ and ‘Around 70% of McDonald’s business is drive thru purchases.’ These facts together really say something about our society. But here’s something else I learned that really says something about us: in surveys and while testing new products, consumers indicated that if there were a healthy option for those Happy Meals you’re buying for your kid once a week, a large majority of parents would chose that option. In practice, only 10% of parents actually buy apple dippers for their kids instead of those extremely yummy fries. To me, that says that while American’s do genuinely want to be healthier and live better, when push comes to shove, they are mostly only giving it lip service. I thought of this recently gained knowledge while reading Pros of Modern Beef Production in the July 19 issue of Feedstuffs. There were some really great quotes in there that are completely Facebook worthy. 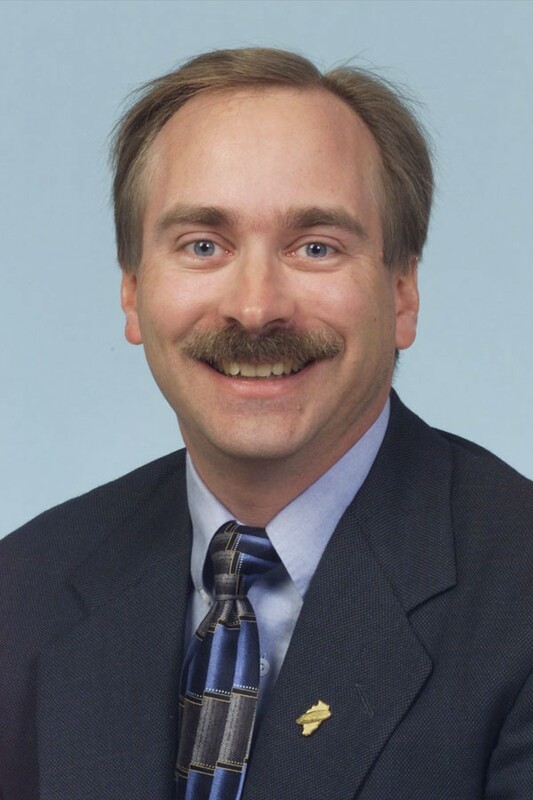 “Contrary to the negative image often associated with modern farming, fulfilling the U.S. population’s requirement for high-quality, nutrient-rich protein while improving environmental stewardship can only be achieved by using contemporary agricultural technologies and practices.” Dr. Jude Capper, Washington State University. “We have the perception that feedlots are bad and that simply isn’t true.” Dr. Jude Capper, Washington State University. Still, I’m left with one important quandary. Much like McDonald’s, we’re doing exactly what the consumer has asked for by producing more meat with fewer inputs and becoming more environmentally conscious and more sustainable while still delivering a quality, safe product. Why then, is the consumer not on board? During my visit at McDonald’s Corporate, they indicated that while menu items must meet rigorous sales quotas or they are removed from the menu, apple dippers will always remain despite their less-than-stellar performance. McDonald’s has to maintain the option that the consumer wants even if the consumer doesn’t buy simply to sustain a positive image. Can livestock farmers do this too without going out of business? I realize that research is showing that consumers don’t want to have to make choices. They want everything that they want and they will not be forced to put a premium on any given option. This is understandable – businesses in our country have always subscribed to the “customer’s always right” mantra. Still, we may have finally reached a plateau where livestock farmers simply can’t offer EVERYTHING that the customer wants. If they want grass-fed beef, livestock farmers will gladly deliver it, but it’s going to cost more, there will be less of it and it’s going to take a toll on the environment. If they want beef produced with a smaller hoof print on our planet, they may have to learn to tolerate feedlots. To which option are they simply giving lip service? Sweet corn is by far one of the most popular summer veggies! 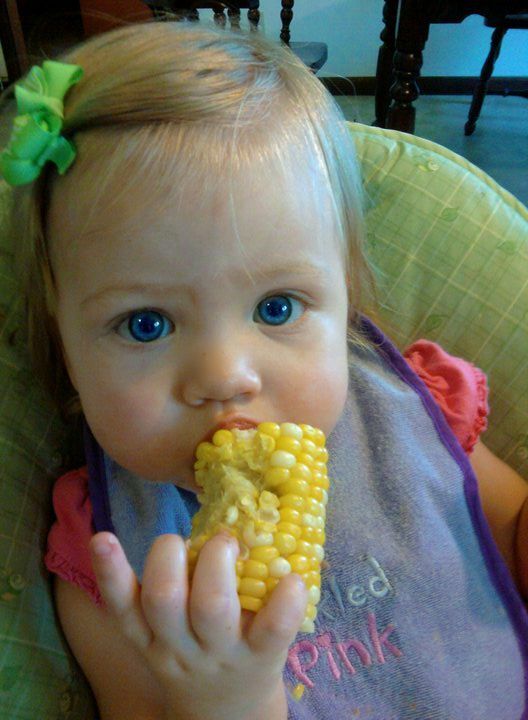 Have you ever wondered how the sweet corn you’re eating for dinner got to your plate? Yesterday, a couple of us from the IL Corn office were granted a day in the sweet corn field with a couple of Northern Illinois farmers. 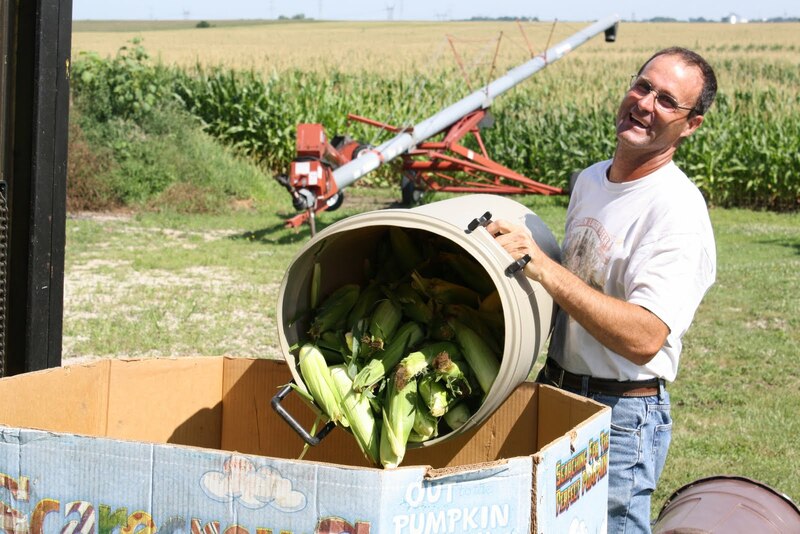 We picked approximately 1,500 ears of sweet corn that were donated to a food pantry. As our morning began we asked farmers, Jim and John, for a quick overview of the sweet corn picking process. While they have been picking sweet corn their whole lives it was difficult for them to describe the art of their technique. We all began working and before long we were covered in mud and sweat along with cuts on our hands from the corn stalks. 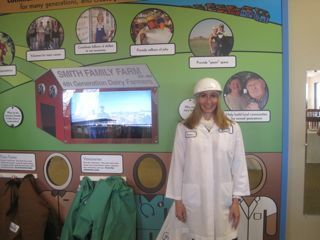 However, we all had a great time and were reminded the importance of our job promoting the agricultural industry! 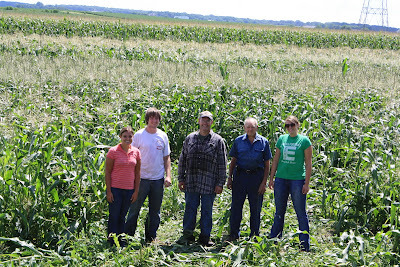 Jim and John’s sweet corn fields were planted in late May and early June. While the weather in Illinois has been challenging this year the sweet corn crop was a success. While every farmer has his own twist as to when the sweet corn is ready they typically revolve back to feeling the ear. The ear should feel full and complete all the way up to the top. 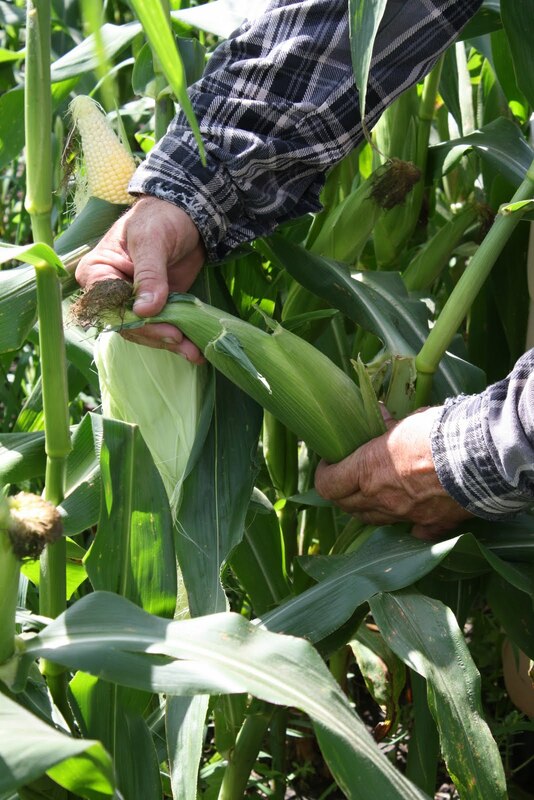 If you are just beginning your picking adventure it is important to pull the shucks back a little ways to check the kernels. This is usually done by puncturing the kernel and checking for a milky juice substance. The sweet corn ear is then ready to be removed from the stalk. Simply pull the ear in a downward motion until it is disconnected. Due to different maturity rates and to track your progress, it is often helpful to stomp down the stalk after you have picked the sweet corn. 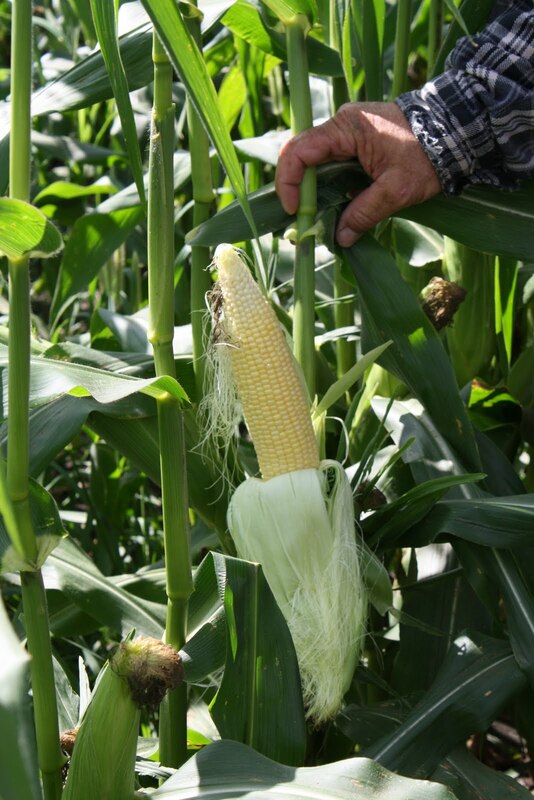 Many sweet corn farmers feel that raw sweet corn fresh off of the stalk is the best and simply irresistible! 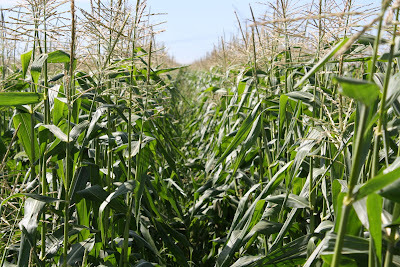 Therefore, it is not uncommon for water and corn breaks on a sunny day on the farm. 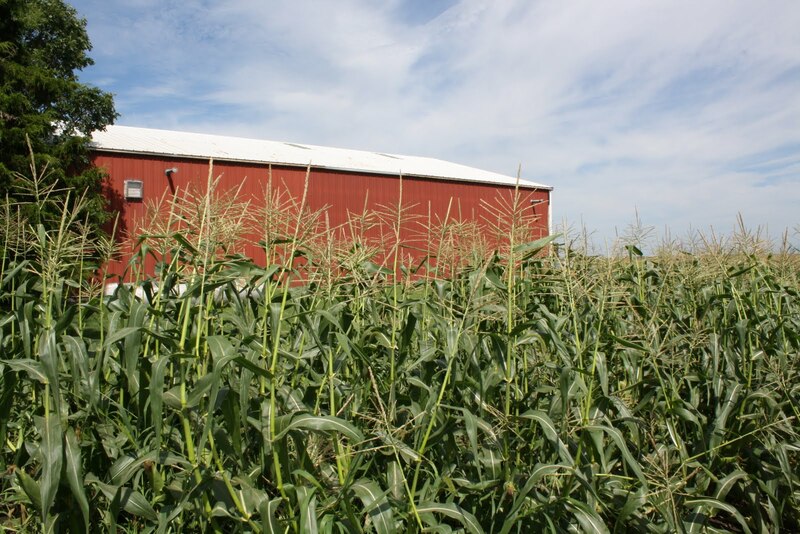 The sweet corn that is left is gathered and sent to your local farmer’s market or grocery store. After a little cooking on the stove, grill, or even microwave the corn is then placed on your dinner plate! Bon Appétit! For those of you just beginning your quest for more knowledge about Illinois agriculture (and maybe for some of you that work within the Illinois agricultural industry every day and just didn’t think through this particular issue), let me describe to you corn’s ethanol quandary. Illinois farmers are really good at growing corn. They grow more and more corn every single year, using less inputs (less land, less water, less chemicals) to do it, and thus, they need more markets for this corn. This is one of the primary goals of the Illinois Corn Marketing Board – to develop markets for Illinois corn. Corn-based ethanol is our largest Illinois market for corn and presents the most opportunity for growth, in turn, demanding more corn. This is good because we have corn coming out our ears. No pun intended. Right now, nearly every gallon of gasoline that you purchase at the gas station is 90% gasoline and 10% ethanol; this product is referred to as a 10% blend. A 10% blend is the highest blend the EPA will allow. But we (Americans) have now reached the point where there are no more gallons of gasoline sold to blend 10% ethanol into, thus, the market is no longer growing and we have more and more corn that will be losing its value. The ethanol industry has asked EPA to consider a higher blend of ethanol in every gallon of gasoline. They suggested 15%, which barely makes a difference per gallon of gasoline, but makes a huge difference to the ethanol industry and thus, to corn farmers in Illinois. This opens up more market space for ethanol and for the corn that creates it. The EPA, being the EPA, has hesitated to approve a 15% blend. They argue that testing data from US Department of Energy on what a 15% blend really means hasn’t been provided to them. 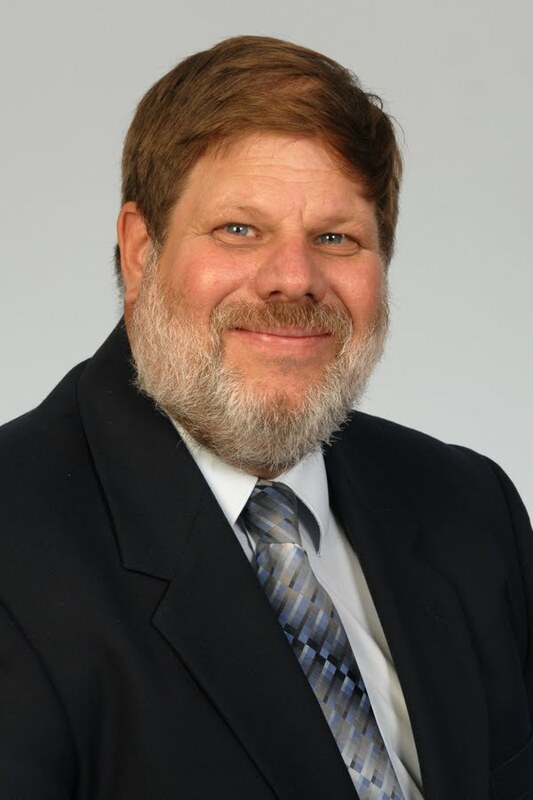 In response to their stalling, the National Corn Growers Association, the American Coalition for Ethanol, and the Renewable Fuels Association sent a letter today asking US EPA Administrator Lisa Jackson to consider an immediate move to a 12% blend which opens up a market for ethanol and allows existing plants to keep … well … existing. The bottom line for corn farmers is that we need additional markets for corn or corn farmers will go out of business. The bottom line for environmentalists is that we need a green, renewable fuel supply to address climate change and emissions concerns. The bottom line for Americans is that we need domestic energy so we can reduce our oil imports and quit funding the countries that hate us. The bottom line for the US EPA is that a 12% blend of ethanol moves us a step in the right direction. And frankly, if underdeveloped and developing countries can make an investment in green, renewable, domestic energy and Brazil can use up to 23% ethanol blends in their conventional vehicles with no problems … why can’t we? We know here in the office you look forward to our Friday Farm Photo all week long. Today we have a special treat for you, not just a photo, it's a Friday Farm Flick! For more great videos check out our YouTube channel! SILVER FIN AN ILLINOIS DELICACY? 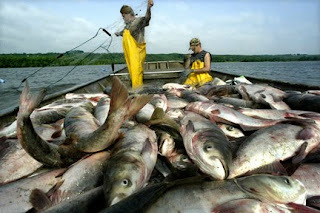 The summer 2010 issue of Our Mississippi brings silver fin (AKA Asian Carp) to the forefront, positioning it as both a delicacy and an important tactic to control the Asian Carp population. According to Baton Rouge, LA chef Philippe Parola, the first step is “rebranding.” He says that the fish tastes like crabmeat and scallops and included several recipes for the readers at home to try silver fin which I’ve provided below. Remember, the multitudes of Asian Carp in Illinois waterways and prevention measures to keep them out of the Great Lakes were a subject of much debate earlier in the year. In fact, the O’Brien Lock and Chicago Lock were closed for a period of time this year to keep the fish out, which also meant additional time and money to get needed products to the Chicagoland area. Perhaps repositioning the fish, which is actually the oldest domesticated fish species in the world and has been farmed for at least 3,000 years in Asia, as a valued Illinois product (The state of Illinois has recently signed an agreement to export the fish to China!) is just the ticket to move the needle on this debate. Preheat fryer at 350, in a bowl beat eggs, then add half & half and stir well to make egg wash. Place the silver fin strips into egg wash, then coat each strip with the seasoned flour. Fry until done and serve with Peckapepper mango sauce. Heat pecan oil and better in a sauté skillet until very hot. Brown seasoned silver fin on both sides, then add white wine and juices from lemon and orange. Bring to a boil, then add all the fresh berries and boil for 3 minutes over medium high heat. Stir in cream and season to taste. Poach or steam silver fin meat until fully cooked, then break it up in pieces to remove bones. Place meat into a mixing bowl and add butter, mustard, 1 egg and lemon juice. Mix well. Add bread crumbs and season to taste. Roll into small cakes. To make egg wash, beat one egg with 2 tablespoons water. Dip fish into egg wash, then seasoned flour. Fry. Throughout time we have seen struggles in American Agriculture. Every segment of the American Agriculture Industry has its distinct issues. From animal rights groups to the use of genetic engineering to develop better hyrbrids, agriculture is always under scrutiny. However, a more significant and prevalent challenge exists. 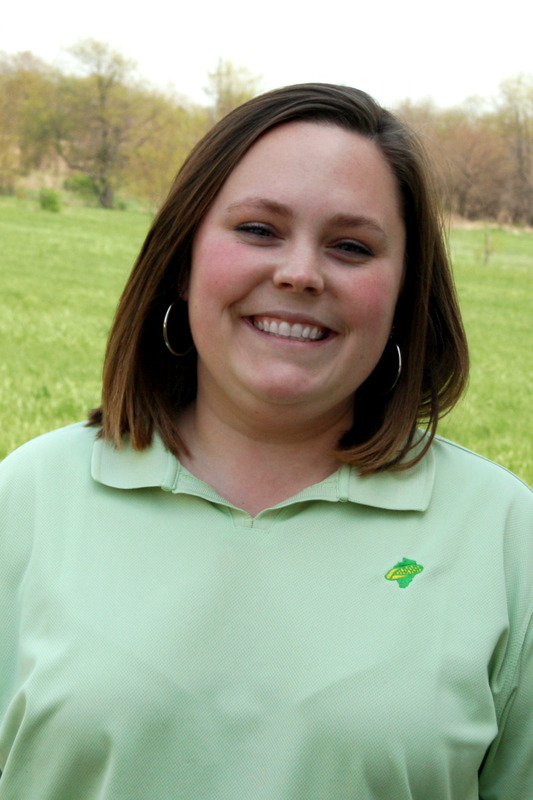 When I served as the Illinois State FFA President I was always asked the question, “What is the most important issue in agriculture?” Working for the Illinois Beef Association this summer, I realize the answer is still the same: Awareness and knowledge of agriculture in the American public. As more and more people become removed from where their food supply comes from, the basic understanding of our industry slowly diminishes. We are all in this struggle together. From the landscaper in the Chicago suburbs, the central Illinois Corn Farmer, the Beef Producer in western Illinois and the southern pork producer, we must unite together to advocate our industry and EDUCATE the public. These people are more than our customers; they are our friends, neighbors, employers and fellow human beings. Cooperation and action will be the solution to this struggle, and will ensure the future of American Agriculture for generations to come! I invite you to read this article on BEEF Magazine that encourages us all to change our mindsets and consider the end consumer in every single one of our conversations about agriculture. Labels: Activism, Animal Care, Food, Who are Illinois Corn Farmers? As a mom of a one year old who’s recently started to eat table food (and she now eats everything in sight!) I paid attention when the Dirty Dozen* list hit the entire popular media list. I just as quickly dismissed it as propaganda as soon as I read through the list, but that’s because I grew up on a farm and I know what conventional agriculture is all about. Naturally, I was excited when the Alliance for Food and Farming released their new report and website last week. As opposed to the “science” the Environmental Working Group (EWG) utilized when creating their Dirty Dozen list, this is real science conducted by real experts – nutritionists, toxicologists, and risk assessors – and they say that organic produce is no healthier or safer than conventionally grown produce. At safefruitsandveggies.com, they offer the time tested truth that if you want to be healthier, the key is to eat more fruits and veggies. It doesn’t matter if they are organic or conventional because each offers the exact same nutritional content. In fact, the report criticizes the Dirty Dozen for making it harder for the American public to consume the proper amount of fruits and veggies each day because consumers are scared and confused about what is safe to purchase. The report also says that my one-year-old would have to consume hundreds of servings of conventional fruits and veggies in a single day in order to have any measurable effect from pesticides. And that’s only if I don’t wash the produce because the FDA says that rinsing fruits and veggies under cold or warm water removes any traces of pesticides that might remain. My thoughts? Let’s stick with common sense. If you want to be healthy, eat a balanced diet, including plenty of fruits and vegetables. Wash them before you eat them. Aren’t these the things that our mom’s and grandma’s taught us when we were growing up? That’s certainly what I’m teaching my daughter. *I did consider linking to the Dirty Dozen list so that you can see what it’s all about if you haven’t heard of it. Then, I read that the EWG says that buying organic as much as you can is not only better for you, but shows that you support decreased soil erosion, safer water supplies, and protecting wildlife. Since conventional farmers actually do some of these BETTER than organic and certainly are as conscious as organic farmers of all, I just couldn’t give them a link in my story. I hope you’ll understand. I'll admit it - I'm a Farmville fan. For any of you that think I'm talking about some small town in IL, let me clue you in. Farmville is a game that people play on Facebook - over 80 million people in fact - and for the vast majority, it's likely the only experience they get with farms, farming, or agriculture. In the game, you are gifted with a small plot of land and a bit of money and with both, you grow, fertilize, and harvest crops as well as buy and receive animals and buildings to create on your virtual farm the little piece of paradise you always wished you had. Well, this week, it appears that Farmville has released a new crop, Cascadian Farm® Organic Blueberries. So before I open up this can of worms, I want to start the discussion by saying that I support the organic farming industry because I believe that more choices are never a bad thing. The problem for me comes when people are disillusioned about their choices, when they don't understand that those organic foods offer the same health benefits at a significantly higher price. And when consumers don't even understand what organic produce is in the first place. Yes, I said it and I'll say it again. Consumers that swear by organic foods have no idea what organic foods really are. I learned this when a colleague told the story of gardening with a friend who purposefully purchased organic plants for her garden and then doused them in MiracleGro and it was reinforced again today. Because I'd be willing to bet money that the folks playing Farmville and planting these sweet little organic blueberries are going to fertilize them to get more "money" from the crop without ever realizing that fertilized crops are not organic. The complete lack of information and the fact that consumers base their buying decisions on marketing hype really anger me. And while I do understand that purchasing decisions based on marketing is the way of our world, a movement to pure organic is going to have much more drastic consequences than buying more Pepsi than Coke would have. So Farmvillians, enjoy your farms and plant organic blueberries until your heart's content. In the meantime, I challenge Farmville to ensure that no fertilizers are used on the organic blueberries and that the yields on organic blueberries are much less than the conventional blueberries. If this is the only connection back to the farm we're going to get, we need to milk it for all its worth. During the National Corn Growers Association (NCGA) Corn Congress, corn farmers from 28 states came together in our nation's capitol to debate issues and set policy for the organization. The highlight of the week was the election of four members of the NCGA Board, one of which was our own Rob Elliott of Cameron, IL! 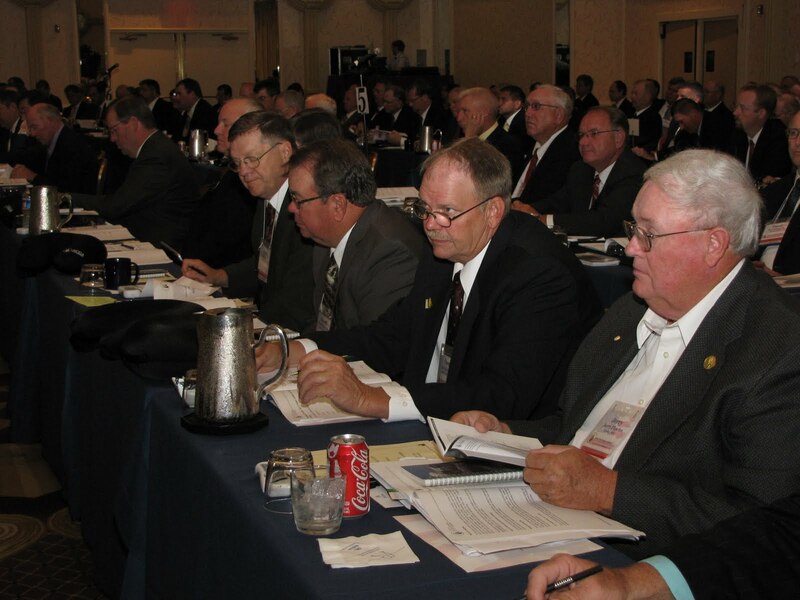 Pictured above is Paul Taylor (row 1, fourth from left) and Bill Christ (row 2) who represented Illinois during policy discussions at Corn Congress. Of course, as mentioned earlier this week, we also visited with every member of Congress (or their staff) and both Senators while in Washington, ensuring that they understand the business of corn farming, the need for markets, and the sustainability of American corn farmers. Out here in DC where many corn farmers from many different states have met to visit their congressmen and work on corn policy, one topic of conversation that bridges all gaps is this season’s crop. Fairly often, you hear one farmer walk up to another they barely know, and overcome any political or ideological differences with one question: "So, are you going to have a record crop this year?" Unfortunately, extremely wet weather in IL makes most of the IL corn farmers answer no, but the subject of record yields and yields that trend upwards and offer less variability are a common topic in our congressional visits too. In fact, growing corn yields are addressed in the new Corn Fact Book that we are giving to each of our elected officials this week. We as farmers understand that when we used to get 150 bushel to the acre, we're now getting more than 200. Consumers, legislators, and thought leaders both in DC and in our communities in Illinois don't know that. This is one place where you can help. Explaining something as simple as Illinois corn's yield trend to your neighbors and non-farm friends can help people understand that there is more than enough corn to provide for all our markets and that our efficiency and yields are still growing! I am proud to be a part of the latest Corn Farmers Coalition ad campaign in DC and around our state and I am equally proud to share the below excerpt from the Corn Fact Book where we explain growing yields. If you could use a copy of the Corn Fact Book in your community work to educate friends and neighbors about corn production, please leave a note in the comments and we will be happy to help you obtain a copy. How do America’s family farmers out-produce everyone else? The roots of this success run deep and wide. There’s know-how – the everyday working knowledge and understanding of how best to plant, raise and harvest a crop. This is not simply tossing a few seeds to the ground and hoping for the best. It involves high-tech equipment that places hybrid seeds at the desired depth in the soil and the optimal number of seeds per acre. It’s the ability to help keep that crop healthy during the growing season. The understanding of where plant nutrients are needed and when – and the technical savvy to do just that. The optimism to invest hundreds of thousands of dollars into a crop Mother Nature can wipe out in an instant. Then comes the continuing advancement of hybrid seed corn – every year means better hybrid seeds for farmers. Plant breeders today have advanced tools to better predict which desirable characteristics will come from its two parents. They can identify those with potential and run tests before a single seed is ever planted in the ground. 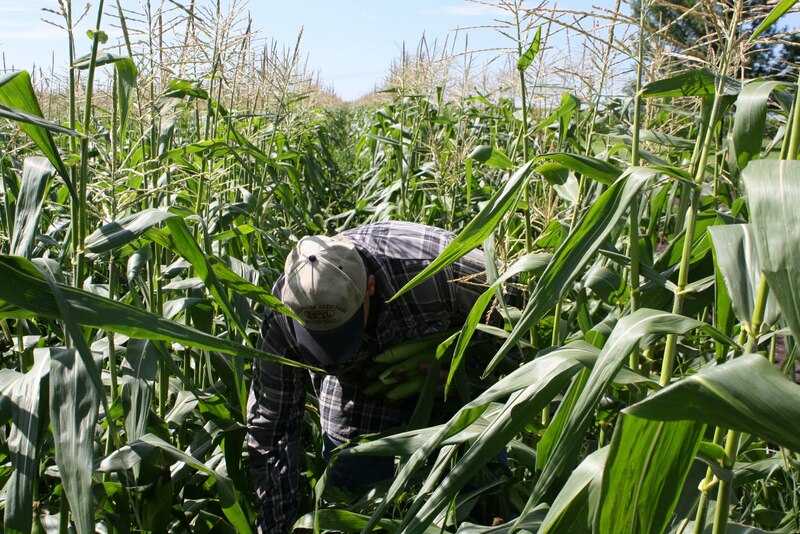 Add the advances gained through biotechnology and the potential from mapping the corn genome, its DNA, and it’s safe to say today’s yields – unimagined a generation ago – are just the beginning. On a beautiful day in Hilmar,CA, the quasi-sweet aroma of the land and the raw beauty of the neighboring almond trees and cornfields surrounded me in the day of the life of a modern dairy farm - a far cry from NYC. What I discovered this day influenced my views and thoughts about dairy cow care and food safety forever. More and more we are questioning where our food comes from and how it is processed. Milk and cheese are two of the most scrutinized foods due to reports of inhumane treatment of cows, hormone and antibiotic use, dairy farming CO2 emissions, and nutritional misinformation. I have to be honest. My family primarily drinks soy and almond beverages. About ten years ago I visited a dairy farm in New Zealand and stopped drinking milk. 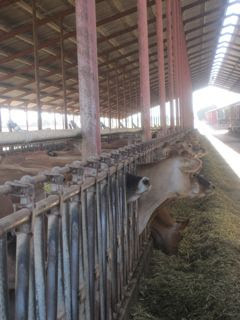 Unlike my experience in New Zealand, my trip to the Clauss Dairy Farm in Hilmar, CA, where 2000 light brown Jersey cows (each weighing 1200 lbs), was much more enjoyable and educational. Will I start drinking milk as a result? Probably not, but I what I learned must be shared. Visiting the Clauss dairy farm was like visiting a spa for cows. Seriously! I was so impressed by the humane treatment of the dairy cows and how content they were. A typical dairy cow’s day includes many of the same activities we engage in. REST - lay resting 12-14 hours per day (6-8 of that sleeping) in free stalls (50% of dairy farms use) vs. communal pens (30% of dairy farms use) and pastures (15%). Beds are made of almond shells, corn husks and wood chips fluffed 2 times per day. EAT - eat 3-5 hours per day (9-14 meals), made of all non-organic corn, rolled corn, cottonseed and barely. Drink water 30 minutes per day. SOCIALIZE – social interactions, like estrus and grooming 2-3 hours per day. MILK - 45 minutes- 3 times per day. Watching this was the most fascinating part of the day. I was completely amazed by the technology, the process, and the happy behavior the cows exhibited through it all. Allow me to elaborate. Step 1- 250 cows enter the washing area where sprinklers mist them for 2 minutes. They dry as they wait to enter the second area. 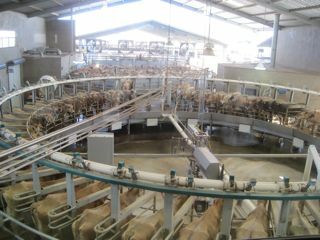 Step 2 – the cows enter the waiting pen (area 2) directly in front of the washing area where they wait to move onto the carousel milking parlor (rotary platform). Step 3 – 50 of the waiting cows excitedly(really!) usher themselves onto a highly technical rotary platform. One cow enters an individual stall on the carousel at a time. Each are quickly checked by a milker for mastitis, and then connected to the pulsating/vacuum machine. They ride the carousel for about 5 minutes (from start to finish) during which time they are electronically monitored by sensors to evaluate how much milk is being extracted (4-5 gallons of milk per cow, per milking – totaling 20,000 lbs. of milk per cow per year). Step 4 - the cow comes to the end of the carousel, a milker removes the electronic connectors and puts iodine on the teets to ensure no bacteria enters. One cow at a time is prompted by a mist sprayer located at their feet to exit (in reverse) the carousel. Step 5 – return to their stall for water and rest. Now that we are comforted by the fact that the dairy cows are well-cared for, let’s look at food safety. During my conversation with Kim Clauss, second generation dairy farmer, and their veterinarian, I learned that the Clauss Dairy farm is a conventional farm. This means that the cow feed is non-organic and the cows are treated with antibiotics and administered BHT (growth hormone). I was a bit surprised to hear this given the trend to buy organic, antibiotic and hormone free dairy products today. What I discovered; however, is that you may be buying antibiotic free when the packaging doesn’t indicate it. How is this possible? What I am about to share is important, so read on. When a cow is treated with antibiotics, it is isolated and the milk is pumped and discarded. When the cow has recovered, it returns to the herd. Each truck carrying some 50 thousand gallons of milk is tested for antibiotics before entering the plant. Any milk testing positive with antibiotics is rejected - a dairy farmers worst nightmare because they stand to lose a lot of money. Rejecting milk with antibiotics is a standard practice across the US. Knowing this, we could assume that all US milk and cheese are without antibiotics. Right? It would seem that way to me. Then why don’t all milk and cheese packages indicate that they are antibiotic free? Is it a scam to get us to spend a few more dollars for products that say no antibiotics? Something else to ponder....According to the veterinarian at Clauss Dairy Farm, the levels of naturally occurring BHT in cows is the same as in cows who are administered BHT. “So why give it to them,” I asked. The answer: Because the cows produce 10-15% more milk. Question? If the levels of BHT are the same in both cows, then why does some packaging indicate BHT free and others don’t? 1. Livestock production (including dairy, eggs, and other animal protein), is responsible for 3% of the world’s greenhouse gas emissions (March 2010), NOT 18% as reported in the 2006 UN Food and Agriculture Report. 2. The dairy cows life span is 6-8 years. They are bred every 13 months. Dairy cows with low production or no longer lactate are sold to other dairy farms or to beef factories. If you want to learn more about what happens to the milk when it leaves the farm, check out this really cool three-minute video (http://www.hilmarcheese.com/CowTour.cms#) from the Hilmar Cheese Company (http://www.hilmarcheese.com/), largest cheese plant in the world, producing 1.4 million pounds per day. We ended our amazing day at the home of Richard and Sharon Clauss who hosted a culinary delight with food made from Real California Milk (http://www.realcaliforniamilk.com/) and created by Chef Ryan Scott (http://www.ryanscott2go.com/). My favorite was the Cucumber and Yogurt Gazpacho with Caraway Seeds and Honeycomb and Panna Cotta with Bing Cheeries. Yummy. Many thanks to the California Dairy Association Board and Real California Milk, sponsors of the dairy farm and cheese factory excursion, for extending an opportunity of a life-time to educate us about how modern dairy cow’s live, how milk and cheese are produced, how dairy farming is eco-friendly, and how milk and cheese are nutritional choices. 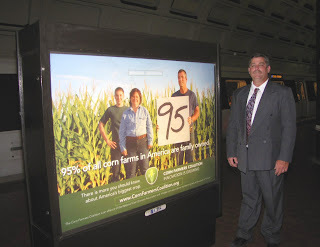 Tomorrow, I set off for Washington, DC along with twenty of so of my favorite Illinois corn farmers. While we're there, we're going to talk corn policy for a bit (determining as a nation of corn farmers what it is that we stand for and what will allow us to continuing growing corn for generations and generations) and we're going to chat with our Illinois elected officials. That's what I wanted to focus on today ... how important it is to make time to tell your elected officials what you think. I know there are quite a few folks that are discouraged and even a little jaded when it comes to politics these days. I'm one of them at times. And I know there are swarms of people who are frustrated that politicians seem to seek only their own reelection instead of seeking to do their job and serve the people in their district. What I say is look at the cards you were dealt and play them. The system is what it is. And until it changes, our goal (and yours too!) should simply be to play the largest part within the system that you can. That means getting involved, knowing your Congressman, Representatives, and Senators, and calling them or visiting them. Because they actually do want to hear from you! Millions of issues come across the House and Senate floor every day and your Congressman can't possibly know the details of every single one. Often, he's looking to his peers and his party to determine what his/her vote will be. But one simple conversation with you might put that issue into perspective and make him think a little harder about his vote. Perhaps you can relay to your elected official that your farm has been in the family for a hundred years and now you are worried that you might lose it due to estate taxes. Perhaps you can talk about your desire to grow your livestock operation, but fear the EPA or the animal rights extremists will ruin your investment. Perhaps your family has occupied the same small town for generations and is now seeing an economic improvement from a local ethanol plant that you'd hate to see go under. Whatever your specific instance, you have experiences that mean something to your Congressman ... experiences that he or she cannot understand until they have spoken with you. Experiences that might ultimately flavor his final vote in a way that you can't even imagine yet. All this bang for your minimal investment to go see him or call him in the first place. Can you imagine if you kept this contact up? What context you could offer her decisions if you had a relationship with your elected official or her staff? This is what the Illinois corn farmers will be doing this week - offering context to the myriad of decisions being made in the House and Senate. 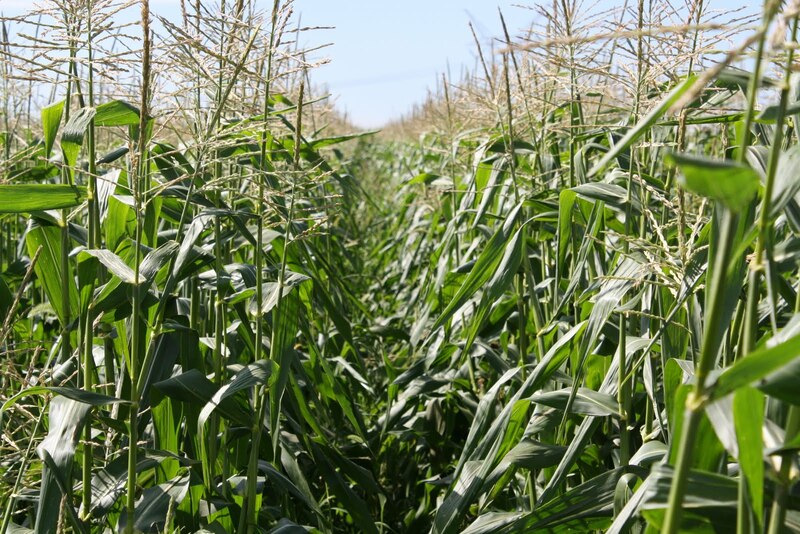 They will discuss how higher blends of ethanol would create markets for Illinois corn. They will thank Congressmen Johnson and Halvorson for their vote to move a free trade agreement with Cuba out of House Ag Committee which will open up markets for Illinois corn if passed. They will explain to the Illinois Delegation what better infrastructure on the Illinois and Mississippi River could mean for Illinois' competitiveness worldwide. You could do this too. Open up the lines of communication. Call or email your elected officials today. During a recent tour of Illinois River Energy in Rochelle, IL, the Illinois Corn Marketing Board and staff learned about new and innovative techniques to produce ethanol that lesson the energy requirement and create more valuable co-products. Corn-based ethanol gets more and more efficient every day! Did you see in this recent study by Stanford University, the researchers determined that high yield agriculture prevented the equivalent of 590 billion metric tons of carbon dioxide from entering the atmosphere? According to the researchers, their results, "Dispel the notion that modern intensive agriculture is inherently worse for the environment than a more 'old-fashioned' way of doing things." High yield agriculture is good for the environment. And these higher yields are what is producing enough corn to fuel our countries green-energy revolution. It’s interesting to me the opinions that non-farm consumers have of farmers. We can see by looking at blog comments, news editorials, and the sheer number of supporters of organizations like the Humane Society of the US, that many people believe livestock farmers to be corporate employees that are unconcerned with the health and comfort of the animals in their care. I visited two beef farms last week. This perception couldn’t be more incorrect. 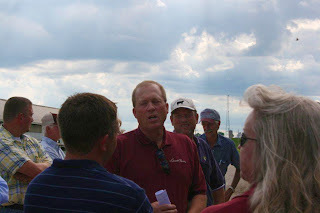 At Larson Farms in Maple Park, IL, I listened as Mike Martz introduced his “staff” who consisted of his wife, his children, his brothers and sisters and their spouses and children, his in-laws, and four full time employees. Guess what? 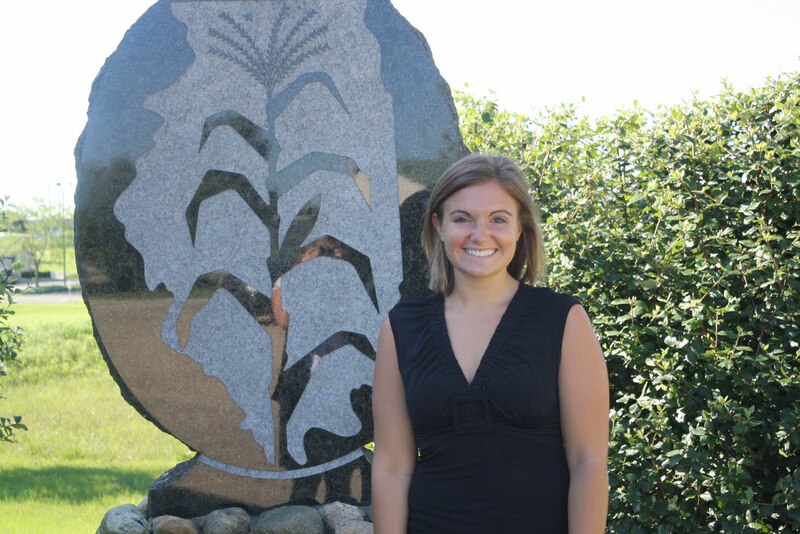 Even the four employees had long histories with the farm and their fathers and grandfathers had worked for Larson Farms for years, nearly passing down their “employment” and family connection with the farm. This is anything but corporate. Likewise, on Jamie Willrett’s Farm in Malta, IL, I pulled up and was greeted by Jamie’s son, Sawyer and followed his other two children and wife along on the tour of the farm. The entire family lives on the premise … and they operate a fairly substantial feedlot. These two farms are both exactly what non-farm audiences fear and exactly what they love. They are large operations that produce beef economically and yet they are also family operations that care about their livestock. I learned at the Willrett farm that Jamie is concerned about dwindling cow/calf numbers. The beef industry is actually divided into three segments, those that have cows and birth calves (cow/calf), those that take those calves and feed them to around 800 pounds (backgrounders), and those that take the 800 pound animals and feed them to 1350 pounds and then harvest them (finishers). The market hasn’t been great for cattle producers in recent years and the cow/calf guys have slowly decreased their numbers until in 2010, we’re at an all time low. Without calves, finishers like Jamie Willrett won’t have animals to purchase and finish. This is a problem the beef industry has to work out. At Larson Farms, I witnessed animals being ultrasound tested, adding efficiency to the operation. With an ultrasound wand (yes, exactly like the ones used on pregnant women), a technician ultrasounds the animal between the 12th and 13th rib to determine thickness of back fat and marbling. The weight of the animal combined with the back fat and marbling prompts a computer program to tell the Larson’s exactly how much longer to feed the animal to achieve the highest grade (and thus, the highest premium) possible. Talk about efficiency. I already knew that every single animal on both these farms has multiple vet visits, preventative health care, nutritionists determining their diet, and safety from weather events and predators, but those aspects of the farming operation need to be pointed out as well. The take home message from my visits was that beef operations in 2010 are efficient and well run or else they are out of business. Comfortable cows are eating, growing, and making the farmer money. Healthy cows are eating, growing, and making the farmer money. Happy cows are eating, growing, and making the farmer money. And efficiencies like breaking the industry into segments or using new technologies to create meat products that the consumer wants are tools that help the farmers make money. At the end of the day, farming is about making money. Farmers don’t exist in a vacuum; they have to feed their families and send their kids to college too. But farming is also about ethics. Farmers treat their animals with respect and care because it helps their bottom line, but also because it’s the right thing to do. 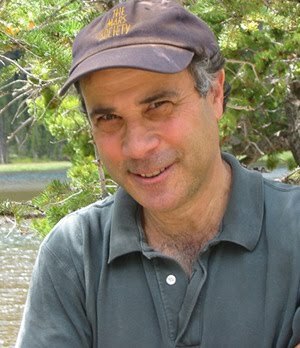 Today’s post comes from an Op-Ed in yesterday’s Washington Times by Robert Zubrin. Ladies and gentlemen of the left and the right: Let's be realistic. There is no chance whatsoever that the U.S. political system will either: A) Pass carbon or gas taxes sufficiently punitive to compel Americans to curtail their driving substantially, or B) Support rapid expansion of offshore drilling for the foreseeable future. Therefore, if neither conservation nor production is in the cards, how can we hope to deal with our nation's dangerous and ever-growing dependence on foreign oil? Here's my answer: We need to cure our cars of their oil addiction. To paraphrase Shakespeare, the fault is not in ourselves, but in our cars; we are made underlings. Let's stop the guilt-ridden breast-beating and place the blame where it belongs. We are not addicted to oil. Our cars are addicted to oil. They are like a tribe of people who, because of some unfortunate flaw, can only eat one kind of food, say herring. Thus, if the herring merchants combine to rig up the price of their product to $100 per pound, the tribesmen have no choice but to submit. They would be far better off if they could become omnivores, capable of eating steak, ice cream, corn, eggs, apples, etc., as the power to use such alternatives would make them immune from herring-cartel extortion. Our four-wheeled servants have the same problem; they can only drink one kind of fuel. Unfortunately, because we are the ones who must foot the bill for their singular habit, their problem is our problem. We need to cure them. Fortunately, such a cure is at hand. The technology exists to make cars that are fully flex-fueled, able to run equally well on gasoline, ethanol or methanol, in any combination. If installed at the time of manufacture, the inclusion of this feature adds only about $100 to the cost of a typical car. The benefits of making such a childhood immunization against oil addiction a standard requirement for all new autos sold in the U.S. would be profound. Were it the rule that only oil-addiction-immunized cars could enter the U.S. market, foreign carmakers would waste no time in switching over their entire lines to flex fuel. Thus, not only Japanese cars sold in America, but also those sold in Japan and everywhere else would be omnivores, as would nearly all other cars sold in any serious way internationally. Within a very few years, there would be tens of millions of cars in the U.S. endowed with the capacity for fuel choice, and hundreds of millions more internationally. Under those conditions, gasoline would be forced to compete at the pump against both methanol and ethanol made from any number of potential sources all over the world. This would put a permanent competitive constraint against future rises in the price of oil. Such a constraint is vitally needed, as without it, current $75-per-barrel recession oil prices could easily explode under conditions of economic recovery to levels of $150 per barrel or more, thereby aborting the recovery itself. While ethanol can make a significant contribution - it has replaced 7 percent of the gasoline used in the U.S. and more than 50 percent in Brazil - the real key here is compatibility with methanol, which can be made in limitless quantities from anything that either is or once was a plant, including coal, natural gas, recycled urban trash or any kind of biomass, without exception. Its current price on the international market is $1 per gallon, equivalent in energy terms to gasoline at $1.90 per gallon - without any subsidy. If we cure our cars so they can drink this fuel, we will protect ourselves from extortion by the oil cartel, forever. A bill has been introduced in Congress to do exactly that. Known as the Open Fuel Standards (OFS) Act, it has truly bipartisan support, with its Senate version (S.B. 835) sponsors including such liberals as Sen. Maria Cantwell, Washington Democrat, and Sen. Amy Klobuchar, Minnesota Democrat; moderates such as Sen. Joe Lieberman, Connecticut independent, and Sen. Susan Collins, Maine Republican; and conservatives such as Sen. Sam Brownback, Kansas Republican, and Sen. John Thune, South Dakota Republican. Similarly, its House version (H.R. 1476) supporters run the political spectrum from Rep. Eliot L. Engel, New York Democrat, to Rep. Bob Inglis, South Carolina Republican. Under the bill's provision, by 2012, 50 percent of all new cars sold in the U.S. will need to be fully flex-fueled, with the number rising to 80 percent by 2015. With a stroke of a pen, Congress can break the power of the Organization of the Petroleum Exporting Countries to tax the world. The OFS bill will not cost the Treasury a dime, and it will protect the nation from hundreds of billions of dollars of potential losses because of future petroleum price increases. Those reluctant to support it need to answer the question: In whose interest is it that Americans lack fuel choice? In whose interest is it that our cars remain addicted to oil? Robert Zubrin is president of Pioneer Astronautics and the author of "Energy Victory: Winning the War on Terror by Breaking Free of Oil" (Prometheus Books, 2007). Wind farms are a growing segment of interest within the agricultural community. They are an environmentally friendly resource that provides the farmer with additional income for his investment in land. Some windmills completely pay for themselves, providing power needs for the farmer and donating power back to the grid. Every once in a while, there are simply too many small little interesting pieces of information scattered all over the web and not nearly enough "news" to make a full blog post. My solution is simply to provide you with all the information and let you educate yourself! A pastor writes an editorial in the USA Today asking the age old question "What would Jesus do?" and relating it to animal welfare. I think this heads in a direction that might surprise many of you. 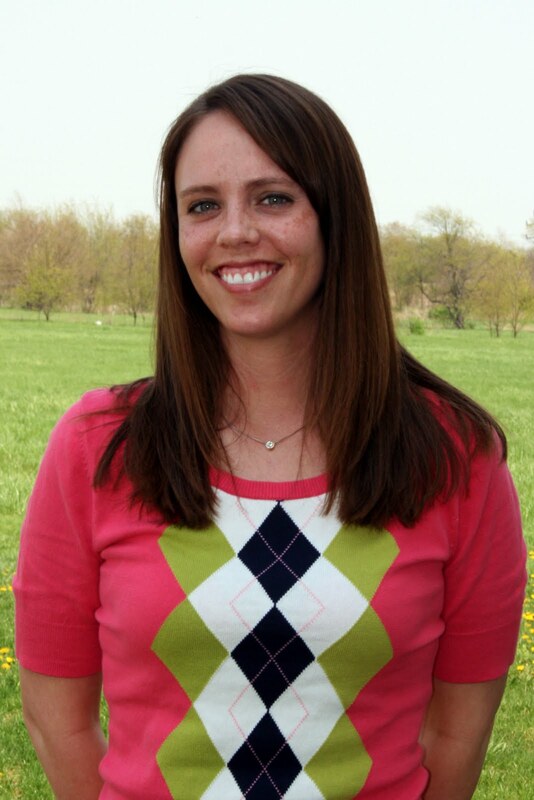 The Illinois Farm Bureau issues a rebuttal to the above story. I challenge you to bring these points up as you visit with friends in your church meetings, softball games, and grocery stores. Check out this video/article on Crain's to hear what the media is reporting about ethanol as relates to the oil spill in the Gulf ... and don't forget to check out the comments to see consumer reactions! NCGA has released a new video about ethanol as an alternative to our country's oil addiction. The video is featured here. And, of course, a landmark decision was announced late yesterday regarding Ohio agriculture's battle against the Humane Society of the US. I'm disappointed. Here's Humane Watch's perspective on the deal ... and you might find something else interesting on this blog as well if you do a little extra reading. As Illinois' corn farmers, we're proud to power a sustainable economy through ethanol, livestock and nutritious food. We love agriculture, the land and CornBelters baseball. Visit us on www.ilcorn.org, or follow us on Twitter, http://twitter.com/ilcorn.